Hunting instructor reviewing gun safety procedures with a young hunter before shooting practice. The future of hunting and wildlife in Texas is in the hands of our youth. 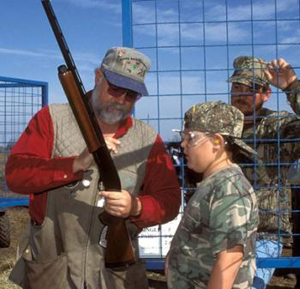 Texas Parks and Wildlife Department encourages experienced hunters to seek out youth and provide the guidance to make the event both enjoyable and educational for the beginning hunter. Texas Parks and Wildlife Department has established statewide Youth Only open seasons for deer, turkey, squirrel and, with cooperation of the U.S. Fish and Wildlife Service, waterfowl. The purpose of these Youth Only open seasons is to provide youth with an enjoyable and memorable outdoor experience and allow parents and mentors to introduce them to safe and responsible hunting. The Youth Only open seasons hunts are scheduled to occur at times when youth are out of school. Drawings are held to select a limited number of participants in high quality supervised Youth Only hunts for deer, feral hogs, javelina, turkey, and alligators. The purpose of drawn Youth Only hunts is to provide youth with an enjoyable and memorable outdoor experience and introduce them to the sport-hunting ethic through an experienced and responsible mentor. The hunts are scheduled to occur at times when youth are out of school and will be structured to make the activities more youth oriented and accessible. The Annual Public Hunting (APH) Permit is a $48 permit, valid from September 1 through August 31 of the following year. The APH Permit allows an adult access to designated public hunting lands in this booklet and in the Public Dove Hunting Areas and Other Small Games Leases Supplement. Having purchased the appropriate Texas hunting licenses and stamps, holders of an APH Permit may take youth under age 17 hunting free of charge on these public hunting lands. Thereby making them aware of the need for proper management of wildlife resources and introducing them to the ethics of sport hunting. The Texas Wildlife Association (TWA) and the Texas Parks and Wildlife Department (TPWD) have joined forces to offer youth hunts that are safe, educational and very affordable. We sponsor introductory, instuctive youth hunts for deer, turkey, hogs, javelina, exotics, dove, small game, waterfowl, varmints and other species. Normally, we provide mentors, lodging and meals. The Texas Brigades is a wildlife-focused leadership development program for high school youth (ages 13-17)interested in learning habitat management, communication skills, and developing a land ethic. The camps, each 4.5 days long, are held on private ranches and at environmental camps in different areas around the state. There are four different camps from which to choose: Bobwhite Brigade, Buckskin Brigade, Feathered Forces and Bass Brigade. Top wildlife professionals and resource managers serve as instructors and mentors. Through these activities, you will develop valuable life skills that will help you no matter your goals.